Once in a while my kids get a hold of my Ipad with our Instagram account open. They love scrolling down and seeing old photos of trips we have taken and of other places we have lived. Yesterday Big Kiddo was looking at all the photos from the year of homeschooling /unschooling we did in Phuket. He has been saying that he doesn’t want to go to school, but rather do school at home like we did in Phuket. I honestly started freaking out. I live for those four hours in the morning when I have the house to myself and I can get stuff done! We went through a week of holidays semi fighting about him wanting to do school at home and me pretty much begging that I need my space. I started feeling bad. Cue the mom guilt in all its glory! My kid wants to be unschooled again and I’m being selfish. This whole ordeal made me start to think about a couple of things…. How much of our Instagram Profile is a lie? How we change the way we see things by looking at your Instagram photos? Before living in Bali, we lived in Phuket for two years. Our house was on the main road that crosses the entire island and the traffic on it was ridiculous. I only crossed that road by foot maybe 6 times and feared for my life every single time. I also do no drive and that meant that I couldn’t go very far on my own. Taxis are not easy like in Bali (thank you Bali taxis!) and so the furthest I could go on my own or with the kids was the local market and mini-shops that were around it. I very quickly got cabin fever and felt like I was stuck inside the house and very very disoriented and stressed out. During this time, we decided to homeschool /Unschool Big Kiddo and his little sister. We were after all stuck in the house so it made sense. I took lots of photos. I wrote a lot about it on the blog. 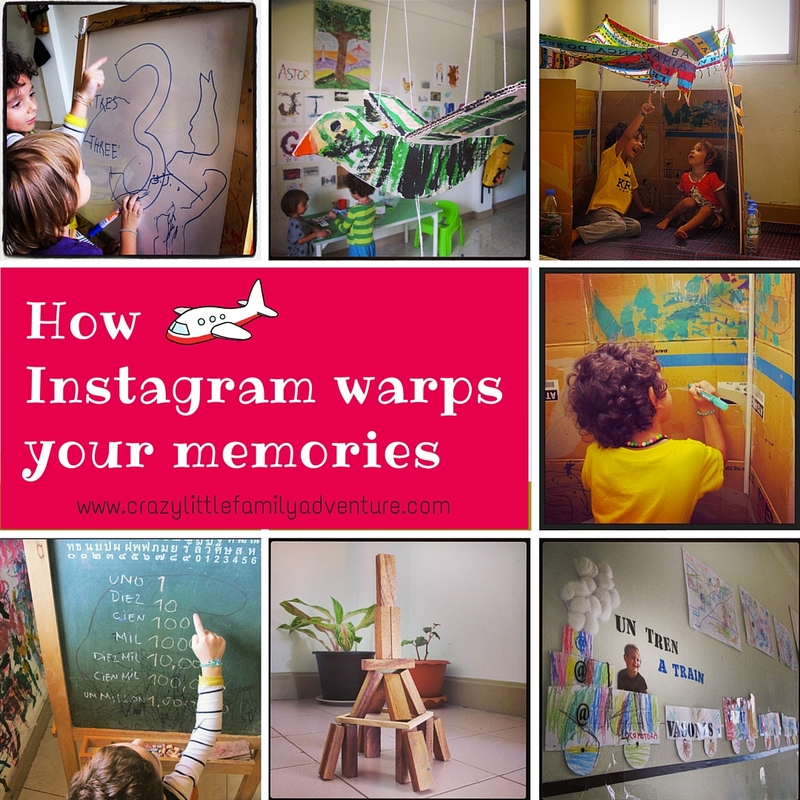 looded my Instagram feed with beautiful photos of my kids learning through art and creativity. We did art, created sculptures out of plastic bottles and tape, made marble races on the wall, built cardboard houses, painted murals. Everything was immortalized on Instagram. Meanwhile I wanted to jump out of the window feeling like a chicken without a head going round in circles. I was not happy, my anxiety and depression was taking a toll. Disclaimer: I obviously wasn’t always stuck at home, it just felt that way. Talking about how feeling and memories are different huh? And then we moved, things changed. When you look at all those photos from back then you really can’t tell I was having a hard time, things look amazingly artistic and wonderfully creative! Now in Bali the kids are going to school and I have freedom of movement. I have projects and work I invented for myself. I still have anxiety and depression but I’m doing things for myself. And then the kids look at the photos of Phuket and tell me they want it to be like that again! I can’t even start to tell you how frustrated I felt for a while about it. Of course they were having a great time, my 100% was on them! So now what am I going to do? I am trying to do that stuff we used to do In Phuket in the afternoons here in Bali. After they get home from school we are going to start doing the kinds of things we did back then. And then I can put it all up on Instagram for the future. It doesn’t get more ironic than this. Are you fully honest in how you portray yourself on the internet? Is your Instagram profile “real”? I won’t blame you if it’s not. We are all allowed some creative angle on our life. I never thought that being creative online would backfire with my own kids! Has anything like this ever happened to you? I would love to hear about it!